Mazda Celebrates 50 Million Units Produced With...Snacks? If you happen to find yourself in Hiroshima, maybe you can snag yourself a souvenir snack set that commemorates Mazda’s cumulative 50 millionth unit production. Available for sale there starting today, this snack set is a collaboration between Mazda and confectionary company Nishikido. 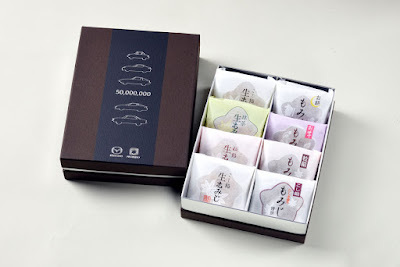 Each box contains 8 pieces of momiji manju, a maple leaf-shaped confectionary made of buckwheat and rice cake. The special set is “representative” of what Nishikido has to offer and thus has filling ranging from traditional red bean paste to green tea to lemon (a Nishikido specialty). The commemorative set comes in a special box decorated with 5 famous historical Mazda cars while an enclosed card contains one design drawing of a “secret car” along with a message from both companies. This isn’t the first time Mazda and Nishikido have collaborated. With both companies sharing deep roots in Hiroshima, they have collaborated before to commemorate the 1 millionth Mazda MX-5 production roll out. The price of this limited-edition release is 1,000 yen (P 481). Sales will end by March 2019.